Fresh Interactive produced the first online disability housing register which is in use by multiple Local Authorities and sub regions across the South East. To create from scratch the online Disability Housing Register (DHR), in order to improve the utilisation of scarce accessible housing by quickly matching appropriate people to the available adapted housing. This would provide a better quality of life for many and make savings for the local authorities involved. The pilot was developed for Reading Borough Council (RBC) in close association with Ability Housing. A thorough systems analysis was carried out of their processes and information flows, and its IT database usage. Best practice throughout the country was considered and a simplified categorisation of property and people was created based partially on the Waltham Forest Model. A new NROSH Complaint online system for the internet was designed, developed and implemented, using Microsoft SQL server. This is able to take data feeds from the local authorities' mainframes, from various housing suppliers and individual browser based input. This register is administrable from anywhere simply by going online and logging in. The Accessahome accessible Housing Register project has housed many people across multiple local authorities and sub regions and saved large sums of money. The new categorisations are being considered across the country, and the project has been mentioned in the House of Lords, Parliament, in select committees, and at numerous conferences. Following its development the idea is being taken up by many Local Authorities and we were asked to participate in the feasibility study to develop an accessible housing register to run across London. The local authorities have not only saved money and placed people in more appropriate housing, but have demonstrated their commitment to supporting disabled people. They have has also shown that they are prepared to innovate using new technology in the best interests of local inhabitants. 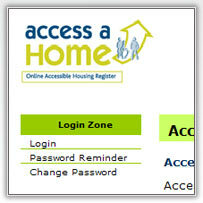 Link to Accessahome Disability Housing Register (many areas of the site require login, graphics by White Design). Working with Ability Housing we have now created a disability / accessible housing register package which can be deployed by any local authority or group of housing associations with adapted property. There are now plans to incorporate Accessahome into the LOCATA choice based letting's system. Helping Local Authorities plan their accessible housing needs 5 Years ahead with this ground breaking CD-ROM.